802.11ac is well on its way to becoming the standard for next-generation Wi-Fi. The gigabit speed, improved capacity and reliability that 802.11ac brings to wireless LANs (WLANs) are amplified as mobile users, devices and application usage continue to grow rapidly. 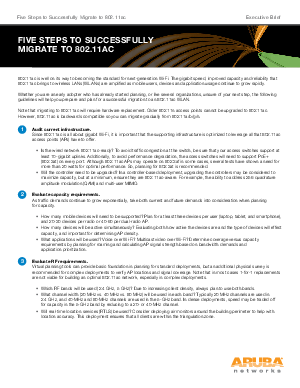 Whether you are an early adopter who has already started planning, or like several organizations, unsure of your next step, download this five step guide to help you prepare and plan for a successful migration to an 802.11ac WLAN.